Until the early twentieth century, the purpose of central banks was to stabilize and control the value of the currency. When currency was backed by gold, that was reasonably easy to do. The amount of money placed into circulation was limited to the amount of gold held in reserve. By the early twentieth century, however, countries, including the U.S. shifted away from a gold-backed currency to fiat money. This changed the functions of central banks from stabilizing currency to actively affecting global economic decisions. When Great Britain gave the Bank of England the power to determine interest rates twenty-one years ago, a questionable and dangerous trend was confirmed. The role of central bankers changed from bit players in the economic realm to all-powerful stars on the global stage. This trend has continued as central banks are buying up billions of dollars in assets and determining and managing policies far beyond economics. The Reserve Bank of India has opined on religious tolerance, while the Bank of England has been vocal on the subject of climate change. As a result, central banks have been criticized for overstepping their role as a monetary stabilizer to determining economic policies, as they widely did during and after the 2008 financial crisis. Since the 17th century, the powers of central banks have fluctuated. Much of these powers were given or restricted by the needs of governments, who demanded stabilization of currency, protection against inflation, and manipulation of global policies. Bankers have been seen as experts, and governments have happily used them when it suited their needs. The relationship between government and central banks has become so symbiotic, it is frequently difficult to determine which entity holds the real power. Since the Federal Reserve was established in 1913, it has had its hands in manipulating the Great Depression, the inflation of the 1960s, and the financial crisis of 2008. Instead of allowing market forces to stabilize the economy, the Federal Reserve has become an active participant, working hand in glove with the government to achieve its ever-changing goals. Perhaps William III of England (and the Netherlands) opened the floodgates. When King William, who desperately needed funds after invading England at the request of Parliament, he created his own bank, the Bank of England, which was then a private organization. In return, he allowed the bank to issue banknotes and trade in bonds. A few decades later, John Law persuaded the then child-king Louis V to establish a central bank in France and had all revenues paid from a bank. John Law convinced the hapless monarch that this would fill empty coffers and help alleviate financial difficulties. The bank took over the country’s debts, while its investors traded bank bonds for shares in what was known as the Missouri Company. John Law’s financial scheme caused the financial ruin of many French citizens, and currency became gold-backed. A lesson learned the hard way. While John Law’s and King Louie V’s plans came to naught, it did demonstrate the usefulness of paper money in a trade vs. gold. Paper was easier to use and carry. While less reliable than gold, when the paper currency was issued by a central bank, it was deemed as trustworthy. From the government’s perspective, issuing money at an inflated value was a nice benefit when it came time to pay off its debts since the debt to be paid off automatically decreased in value. As someone might have said, it’s good to be king. America’s first Secretary of the Treasury, Alexander Hamilton, looked to Europe for guidance as he faced unchartered financial territory. He supported a powerful central bank to stabilize the currency and help the new U.S. economy to thrive. His was a minority view. Hamilton’s opponents saw any centralized power as a new danger. In the current popular musical “Hamilton,” Thomas Jefferson says derisively, “But Hamilton forgets/His plan would have the government assume state’s debts/Now, place your bets as to who that benefits/The very seat of government where Hamilton sits.” Hamilton won the fight, but his central bank lasted for only 20 years. Jefferson was not the only one suspicious of central banks. It was believed that such government banks would favor lenders over debtors. The Bank of England moved to the gold standard, which allowed bank notes to be exchanged for the precious metal. This policy ensured that currency remained stable and could be not manipulated. This lasted until 1825. In France, gold-backed currency was abolished during the chaos of the Napoleonic wars. As a result, inflation was out-of-control and debt spiraled. France learned its lesson the hard way and restored the gold standard in 1819. Financial stability was restored for decades, although the central bank was forced to raise interest to attract foreign investors. This hurt the working poor more than the wealthy, but only property owners had the right to vote. France set its priorities accordingly. 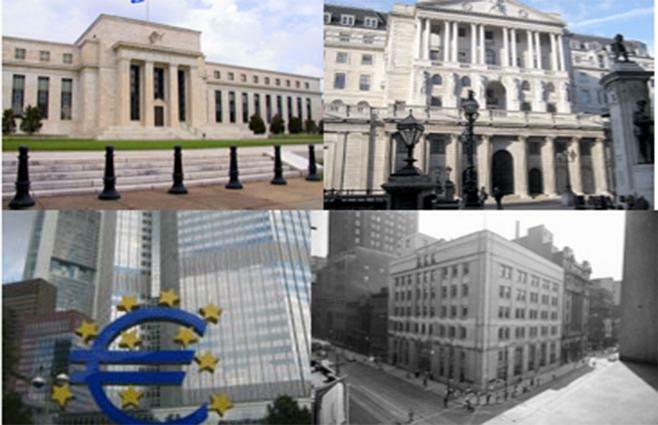 By the 19thcentury, central banks expanded their powers in the area of crisis management. The freedom inherent in capitalism brought with it great financial fluctuations and could lead to panic. In 1825, the British economy crashed following questionable investments in dubious South American enterprises. The Bank of England entered the fray as the “lender of last resort.” It was able to lend money to solvent banks at high interest rates. This involved increasing the supply of money, which was contrary to the purpose of the central bank. This “lender of last resort” concept caught on. Following the creation of the Federal Reserve, it was quickly placed in crisis mode by WWI. The Bank of England refused to exchange banknotes for gold, a policy which still partially exist to the current day. Most other countries simply printed money at an alarming rate, only to experience inflation and hyperinflation, as in the Weimar Republic. If central banks mismanaged money during the post WWI era, it continued its manipulations in the 1930s. During the Great Depression, almost half of American banks collapsed, along with their customers’ assets. Following WWII, the Federal Reserve continued its easy monetary policy, despite the resultant inflation. President Truman wanted Fed Chairman Martin to maintain low rates, but Martin had no such intension, thereby causing further inflation. President Johnson resorted to bullying Martin. President Nixon used the power of the press to leak false rumors about Martin’s successor, Arthur Burns. President Nixon proved to be the champion bully of the three heads of state and won that round. Interest rates were kept low. The post-WWII era saw the power of central banks increase as they went head to head with their own governments. The initial purpose of central banks has clearly changed as their powers and responsibilities have broadened. They have become crisis managers, but have not always proven effective in that role. What their future role will be is uncertain. But once power is acquired, it is rarely given up easily. Since the 2008 financial crisis, the Federal Reserve’s balance sheet, consisting of assets, liabilities, and equity, has come under closer scrutiny. 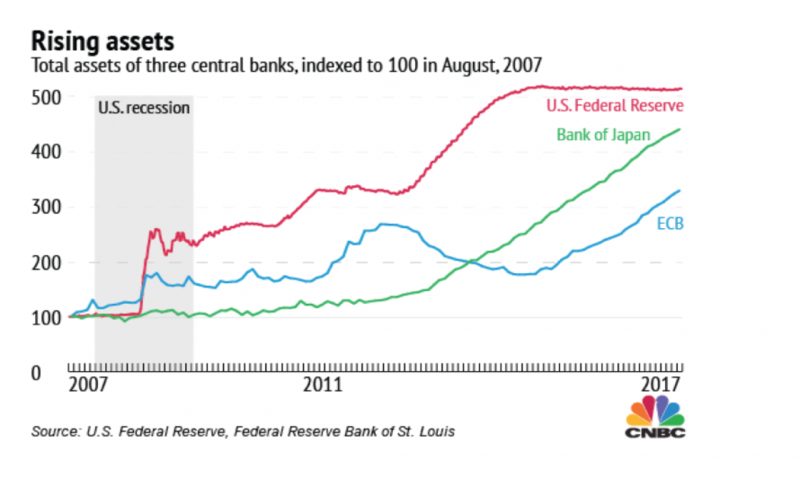 As indicated in the chart above, central banks have increased their assets considerably since 2008. 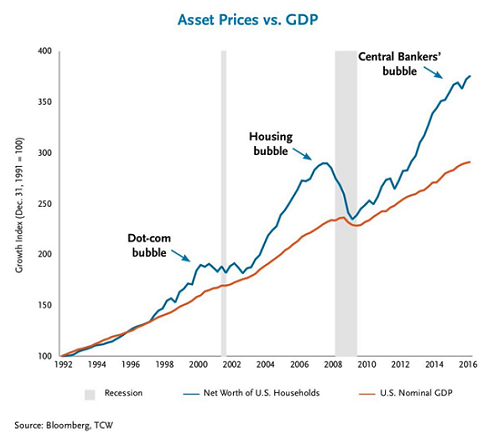 At $4.476 trillion, the Federal Reserve assets comprise 23 percent of GDP. That number is actually low when compared to the 93 percent held by the Bank of Japan.